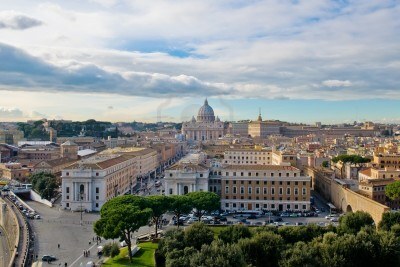 It’s difficult to imagine, that in a so little space there is so much history, culture and charm... but this is Rome! The Tiber Island has volcanic origin, it’s 300 m long and 90 m large and it represents one of the most fascinating places of Rome. It’s also called Nave di Pietra (Stone Ship) because of its shape. 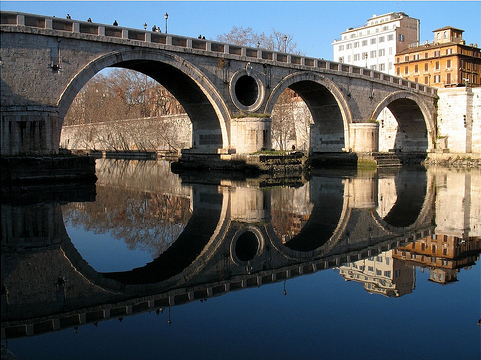 It’s connected to the dry land through two beautiful bridges, “ponte Cestio” (46 b. C), in the direction of the Jewish ghetto (Synagogue and Portico D’ottavia), and Ponte Fabricio (62 b.C.) toward piazza in Piscinula. The Island has always been related to the devotion for medicine, before with the Temple of Esculapio (290 b.C. ), and today with the Jewish Hospital and the Hospital Fatebenefratelli. In the hospital Fatebenefratelli, is situated the courtyard of the 17 century. In the middle is situated a beautiful fountain decorated by four turtles. You can visit also the Museum of the medical and surgical instruments. In the place of the temple of Esculapio, we find today the Church of San Bartolomeo all'Isola (in the past it was dedicated to Saint Adalbert, martyr in Danzig in 998), and its bell tower (113) with Romanesque style. The Church is rich in art, it has a basilica plan with 3 naves, divided by ancient columns, maybe those one of the missing Temple. At piazza San Bartolomeo, the Pit is believed to be situated where there was in the past the Temple of Esculapio, and that there was the holy spring in the temple, considered miraculous water. The marks of the chain used to lower the bucket are still visible today. From the square it’s possible to see the “Palazzi Castello” (castles –palaces) also called Castello Caetani, a complex of palaces built during 4 centuries. Inside you can visit the historical museum of the Island, and outside the great tower built during the X century by Pierleoni family also called of the “Pulzella”, because you can see an ancient marble female head into the walls. On the Island we find the “Colonna Guglia Jacometti”, the Monastery Saint Bartholomew and the Oratory Sacconi Rossi, which takes its name from the confraternity. It is situated on the left of the church of Saint Bartholomew and it consists in an underground oratory and if there is illumination, you can see an ossuary through the grills. On the Island we find another church, Church of Saint John Calibita, the façade of the church is incorporated to the Hospital Fatebenefratelli, it’s worth noting the cloister and the bell tower restored between 1930 and 1934 of the XIII century. 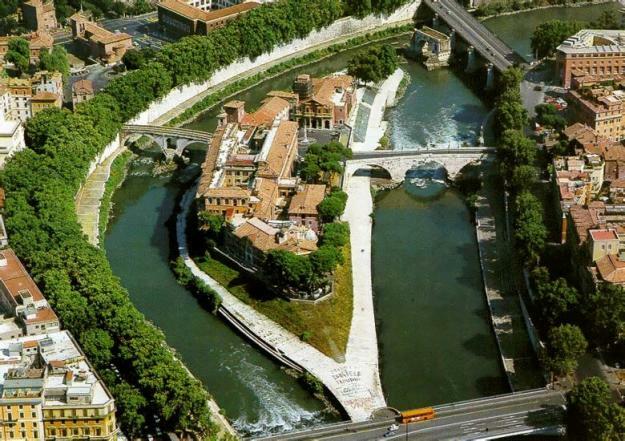 The Island shows its best with “Estate Romana” (Roman Summer), welcoming the cinema with “Isola del Cinema” (Island of the cinema) which shoots international movies, in an open-air movie theater, on the banks of the Tiber river among the architectural lightened beauties of the island. Moreover, the perimeter of the river is surrounded by great crowds, stalls, various restaurants, pub, sushi bars, cocktail bars), cabaret shows, music or theatre until late night, under Rome’s sky. 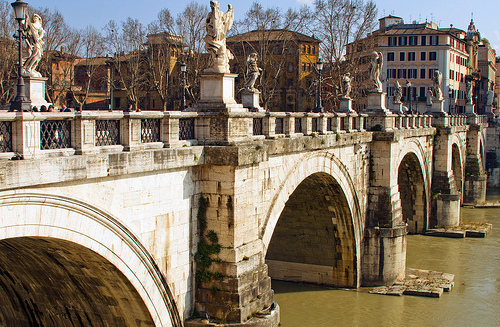 The Bridges of Rome, are a treasure hidden in the noise of Capitoline traffic. Quiet and discreet, they contain the history of the city from the beginning to the present. Officially, there are 28 links that connect one bank’s city to the other, but the fundamental and oldest ones, are: Sublicio, Emilio, Milvio and Sisto, that more than others have their own story to tell. But instead of looking in the texts or documents, it can be much more useful and interesting to visit and observe the bridge itself. In fact, on each bridge, through the works of art, plaques and statues you can find information on the life of the bridge itself. At the end of the seventh century BC, Anco Marzio reigned - the fourth King of Rome - who built the first bridge using sleepers of hard wood, named “sublicae”, that gave the name to the bridge without using either iron or bronze. The need to build a bridge came from the desire to communicate with the people who lived on the opposite bank, mainly the Etruscans, holders of valuable knowledge. It stood at the door Trigemina (today Portaportese), between the Hospice of St. Michael and Aventino. In the centuries, the original wooden bridge has been lost, so in 1914 they began the work of construction of the three arches of the stone bridge. Best known as the "Broken Bridge", was built to be attached to Sublicio as unf it for the passage of wagons and heavy materials from the quarries of the tuff of Monteverde. So in 179 BC the censor Marcus Aemilius Lepidus was in charge of building the bridge that was completed after 37 years of work. It was the first masonry bridge and it was renovated several times because of numerous landslides and heavy flooding, until that of 1598 which heavily severed the bridge of his half, conquering the name of “Broke Bridge”. Of the old bridge, it remains only an arch. 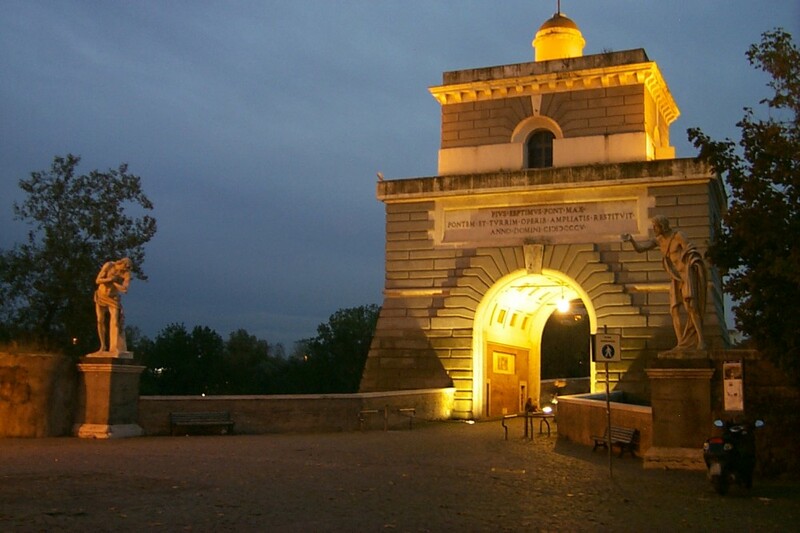 In fact, from 1853 to 1857 they applied to it a metal roof to join the rest of the bridge with the left bank of the river, but when the support was permanently removed, it remained only the arch put in modern times between Ponte Palatino and Tiber Island. 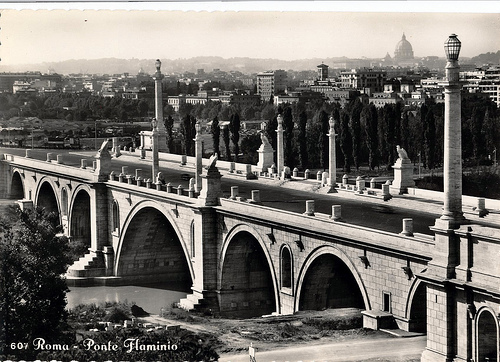 Is one of the oldest bridges in spite its distance from Porta Flaminia. Built in 109 BC by the censor Emilio M. Scauro, is known as Ponte Mollo (Soft Bridge), because in 12 BC an arch was demolished by a sudden flood of the river, and replaced by another one made of timber that moved when when you walked on it, hence its beautiful nickname. Made of six masonry arches, it is 132 meters long. 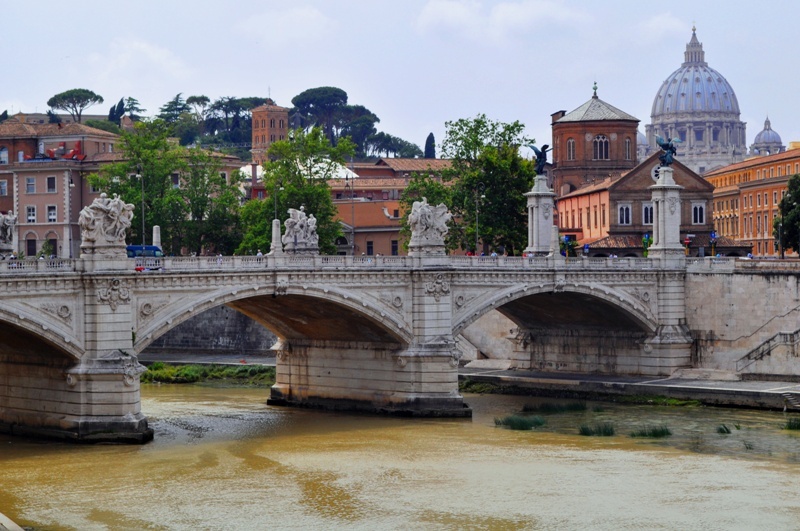 Although the story says it was built for Pope Sixtus IV to allow the crossing of the Tiber, it was certainly built on the ruins of an old Roman bridge. The first structure may be attributed to the son of Septimius Severus, nicknamed Caracalla. After the flood of 792, the bridge was unusable until the Holy Year of 1475, when Pope Sixtus IV decided to build a completely new bridge. 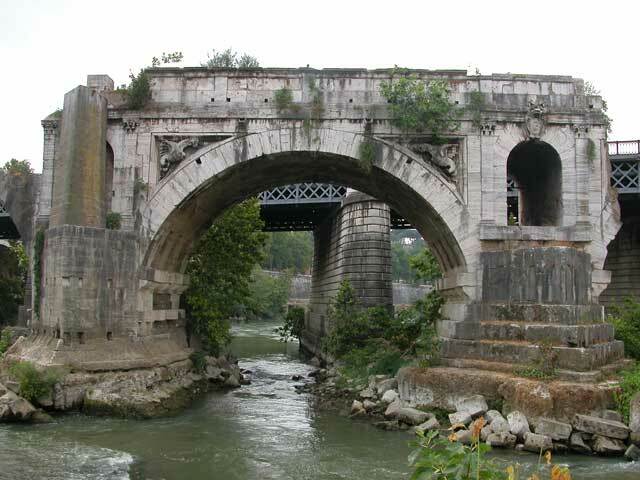 It is divided into four arches and a round hole on the central pier, which serves to reduce the water pressure during the floods of the Tiber. Particular is the construction of the pavement that led to the horizontal line of the bridge to a gentle curvature "humpbacked." 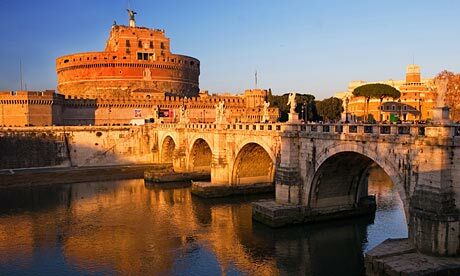 A must reference even on Ponte Elio, the most striking, better known as Ponte Castel Sant 'Angelo, built by architect Demetriano in 136 BC and committed by Emperor Hadrian to link the left bank of the Tiber to his mausoleum. 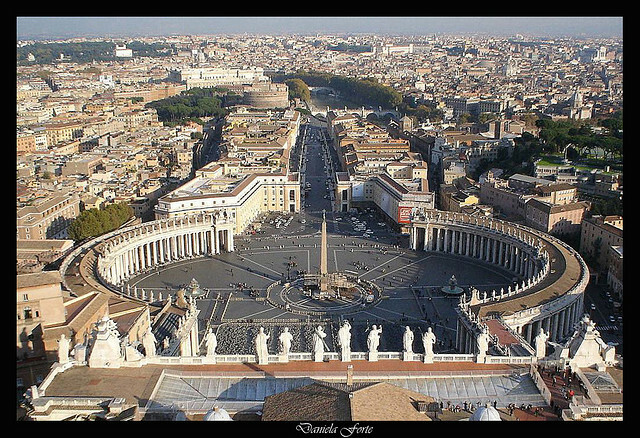 In 1535 Pope Clement VII placed at the entrance of the bridge the statues of St. Peter and St. Paul, and were later added four statues representing the four evangelists and the four patriarchs Adam, Noah, Abraham and Moses. In 1669 Pope Clement IX ordered Bernini the construction a new railing on which there were placed ten statues of angels bearing the instruments of passion. It is 108 metres long and 20 metres large. It was dedicated to the king Victor Emmanuel II and designed by the architect Ennio De Rossi in 1886, but it was inaugurated only after 25 years, on the 6th June 1911, during the 50th commemoration of the unification of Italy. It was a masonry work with three circular depressed arches. It is decorated at the ends with 4 basements and on them 4 bronze "winged Victories", holding in their hands many symbols; the crown of victory, the military panoply, the shield, the sword, the broken chains, the branch of oak and flowering garland , and on central arch of the bridge, there are 4 travertine sculptural groups, realized by Reduzzi and Nicolini symbolizing "the unification of Italy", “the Freedom", "the Defeated Oppression " and the "Faithful to the Statute”. 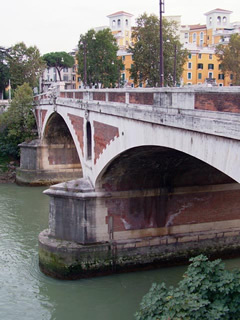 It is undoubtedly one of the most suggestive bridges of the Tiber. Rome, built on 7 hills , can’t lack wonderful and charming observational platforms, some natural others situated on famous monuments. Janiculum hill (Piazzale Garibaldi), place symbol of the Italian Risorgimento but also of the lovers of Rome ( like Milvius bridge ). At the centre of the small piazza the wonderful monument of the patriot Giuseppe Garibaldi sitting on his horse. It is situated at the foot of the hill Trastevere but the view extends as far as the Colosseum, and the cupola of S. Peter isn’t seen. Garden of Oranges (Aventine hill), from there you can see many views of the city included the Victorian. Terrace of the Zodiac (Monte Mario), it is situated on the Flaminio area, very good place for tasting a aperitif ( there is a bar) with charming view. Pincio (piazza del Popolo), former private property of the Borghese family and given to Italy only at the end of the 19th century. Besides the panorama the villa is rich in statues, fountains and decorations. Terrace of Castel S.Angelo, to enter you must pay the ticket in the museum, but the all-around view of the city is incomparable. Terrace of the Victorian (piazza Venezia), you arrive at it through a modern lift situated at the back of the building where are situated the stairs to the Capitoline Hill. 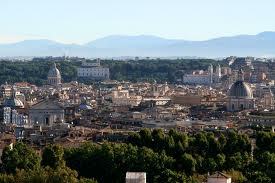 From there you can see almost all the remains of the ancient Rome. Cupola of Saint Peter, on the right of S. Peter’s portal the markings will lead you to the Cupola. 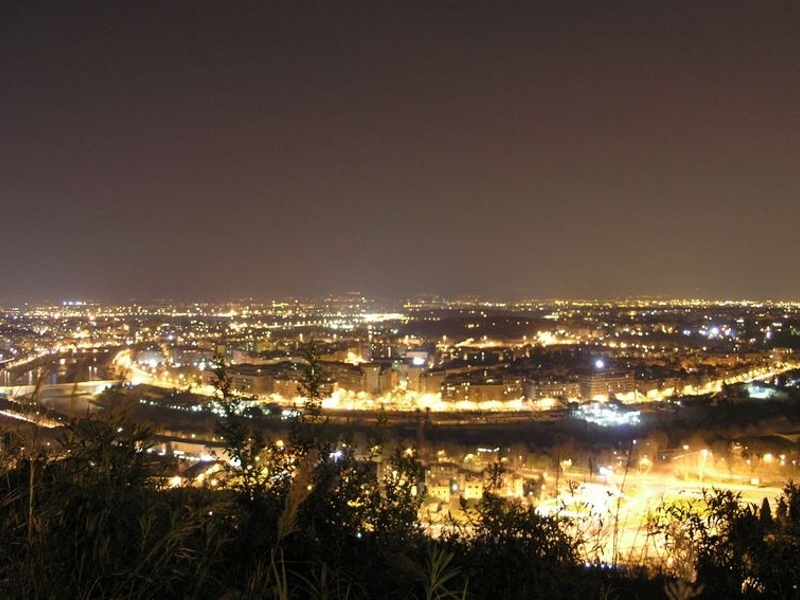 You must pay for the entry but the view is wonderful, it is 137 metres high and you can see the all-around view of Rome. Caffarelli Terrace, is situated on the last floor of the Capitoline Museums. Climb the stairs into the Caffarelli Palace, and you see below you the Ghetto and the Marcello Theatre.